Here is a fair question, why discuss barrel bombs at all? It is clear to anyone who pays attention to world news that President Assad of Syria is using old oil drums filled with caustic chemicals to wipe out his entire population. No western paper, no Russian news bureau, no Arab network of news website has challenged this “fact” so often reported, in all cases at the hands of the Syrian Human Rights Observatory, a CIA “sockpuppet” front. Are people that stupid? The answer to that is a bit more complicated. In general we can say, “Yes,” but it goes further. You see, when you combined a “branded” lie, and the barrel bomb is quite an ingenious fabrication, all that is needed is to repeat the same story, endlessly like the BUK missile myth with the air to air downing of MH17 by a Kiev backed fighter jet, you don’t need facts. As soon as “barrel bomb” is brought up, suddenly the mass graves, the televised beheadings and the CIA training camps in Turkey and Jordan no longer exist, “Assad did it all,” as reality flies into the stratosphere, part of a well-orchestrated disinformation campaign where assertion is fact. Any allegation that is printed or broadcast by the mainstream media is a “fact.” Groups like the Syrian Human Rights Observatory exist to infect the already controlled corporate media with disinformation created by PJ Media, the Heritage and Jamestown Foundations and the Rand Corporation. See how this played out in July 2015. This week, the TASS news agency in Russia published a story that was originated from the Syrian Human Rights Observatory. The story was published because it had a reference to ISIS using chemical weapons. There was no substance of any kind backing up this story, what the article said it was about, no dead, no injured, no proof, in fact the story wasn’t about ISIS at all. The story, after the first few word, began the humming diatribe we who watch the news recognize quickly as the heavy hand of the CIA. The real story stated as fact that the Assad government had used chlorine “barrel bombs” to kill up to 220,000 of its own citizens. No one has ever seen a barrel bomb. As a chlorine barrel bomb wouldn’t even be explosive, 40 gallons of household bleach and 2.5 gallons of food grade vinegar for those who are curious, the remains of these spurious weapons would be entirely intact. Of course there is no such thing as a chlorine barrel bomb. 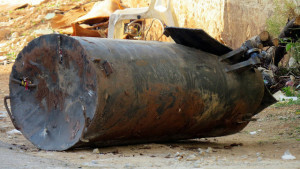 A simple check of Google Images searched under “barrel bomb” will turn out a few poor quality Photoshopped images of helicopters dropping unrecognizable debris but mostly assorted images of abandoned barrels, some rusted for decades, hardly something someone would load onto an aircraft filled with caustic chemicals or high explosives. When, during the Gaza campaign of 2014, cluster bombs, napalm and deadly white phosphorous were used on schools, hospitals and children’s play areas, according to an official report of the United Nations Human Rights Agency, that story ran for only one or two days and in less than 10 percent of the media. Even then, each and every play of that story included a lengthy and vigorous denial by the Israeli government, always based on ad hominem attacks, never using facts, references or reputable independent sources. Let’s take a second to compare “lie machines.” When Israel cluster bombed the United Nations refugee center in Gaza, they claimed they did so based on reliable intelligence that Hamas was using the facility as a missile factory. When UN investigators asked Israel to “prove it,” Israel refused. When UN investigators visited the scene of the carnage, there was no evidence of a bomb factory and no evidence of any military presence at all. This was the case, time and time again, wild assertions that, when finally investigated, became the subject of a war crimes tribunal. In Syria it is different. You see, al Qaeda and ISIS control the areas where the carnage is said to have taken place. However, though no UN agency nor any press organization can visit these areas without being kidnapped or burned alive by ISIS or al Nusra, the Syrian Human Rights Observatory claims to have exclusive access. If the Syrian Human Rights Observatory is a CIA operation as we assert, then this would be an indication that the CIA also moves freely with al Nusra and ISIS. However, if we are wrong, then the Syrian Human Rights Observatory is, in fact, an organ of ISIS and al Nusra and is, in fact, a press organ of a terrorist group. Based on this group being headquartered in London, heavily financed and its assertions, always unsupported, being parroted in the mainstream media, the case for CIA, MI6 or Mossad control is far from an assertion. Moreover, were one to look for historical context, there are endless opportunities. LBJ’s Tonkin Gulf incident is a classic. Then there is the USS Liberty. This is one that keeps on giving, with new spin, new claims and counterclaims. Let’s take a second to look at Israel’ most recent “assertion” as to why they attacked this US flagged ship back in 1967. So, the public was told Israel mistook the American spy ship for an Egyptian barge while the Israeli military told American officials that they believed that the US and Soviet Union were ganging up on Israel along with Egypt and Syria as part of a bizarre “there wasn’t really a Cold War at all” conspiracy theory. This is what they still teach in Israeli schools to this day. What is important is for intelligence analysts to learn to recognize disinformation branding and the use of “talking points.” By talking points, we refer to email missives sent from “interest organizations,” fronts for spy and terror groups, extremist political organizations and think tanks to their “actors” in the field. By “actor” we mean politicians, public figures and media types who are directed to stay “on message” to promote the agenda of the day, usually a pretext for sanctions or direct military action. The, of late daily, “BUK missile” talking points are aimed at taking down Russia, a daunting task certainly. It was long assumed that the “barrel bomb” campaign would have, by now, gotten a no fly zone over Syria and buffer zones established as well. Then again, these “branding” or “talking point” campaigns are only an interim device. When they officially fail, and this one is clearly doing just that, something more serious is brought to bear. The downing of MH17 was, undoubtedly, such an act. What will the next one be?